Here’s another in this series of images of leaves. I used a somewhat different approach from the previous image. This, I believe is the best so far of the series. Does anyone agree or disagree? A print is on display at North Mountain Arts in Hedgesville, WV if you would like to see the real thing. These images are partially a result of a combination of boredom and a bit of guilt for not having done very much new work over the winter. Bored because I have been wanting to do something new and different and guilt because I have been mostly in hibernation mode over the winter. I must also admit being inspired by some work I saw recently by George DeWolfe, who has created a stunning series of images of fallen leaves with his Forest Floor gallery. 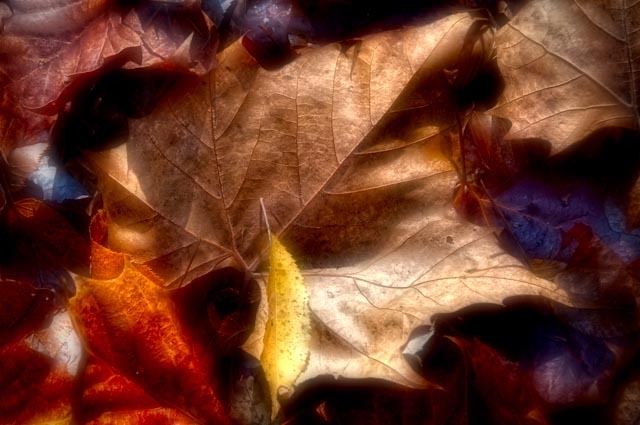 I have photographed fallen leaves a lot over the years but never really figured out what to do with them. After seeing George’s work, I was motivated to revisit some of my images to see what I could do. I won’t claim to have achieved the artistry that he achieved, and it is not my intention to duplicate his work, but I am enjoying exploring some new techniques. ~ by Admin2 on March 12, 2011.